A warning has emerged that law enforcement and intelligence agencies across the world to watch out for copy attacks, of the type on Charlie Hebdo magazine in Paris, which claimed the live s of 12 staff that included the editor-in-chief, Stephane Charbonncer, and a famed cartoonist, Luz two police officers. The warning given by Morrell and published by the CBSNEWS said that the United States as a country needed to be alert. But already, Global Pentorch research shows that the terror attack in Paris on Wednesday had some resemblance to an earlier attack in Boston, Massachusetts, United States, during a Marathon race, which killed three people and injured 264 others. Just like the terror attack in Boston that involved two brothers named Tamerlan and Dzhokhar Tsarnaev, the attack in Paris also involved two brothers named Said and Cherif Kouachi respectively. Tsarnaev brothers, like the Kouachi brothers were at large after they devastated the Boston Marathon. And just as the police manhunt led to house to house in search of a part of Boston for the Tsarnaevs, the police in France are now involved in a house to house search in a search for the Kouachis. Reports said the Kouachis were sighted at a gas filling station about 100 miles away from the scene of the attack and that they were heavily armed like the Tsarnaev brothers were announced as heavily armed, when the police in Boston first released information about their identity. Just like the police in France are currently tracing the whereabouts of Kouachis and have found a car abandoned by them in the same area the gas station is located, the police in Boston also went after the Tsarnaev brothers, before an encounter and the death of Tamerlan, during a face off with the police. Latest report say that police in Paris have ordered residents in a town near Charles De Gaulle Airport to remain indoor, as police are said to be closing in on the the terrorists. Remember the lockdown in Boston. Dzhokhar Tsarnaev, who was arrested later in a hideout after Tamerlan's death had been in custody and about to face trial in the U.S. 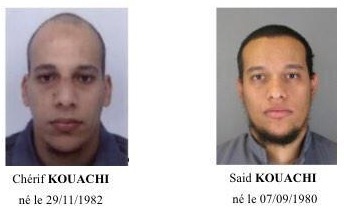 The scenario in France also points to a possibility that the police would find the Kouachi brothers. And since the police is aware that the felons are heavily armed, the police is equally ready for the worst.